First thing’s first, Planet Comicon was way bigger than we expected. The convention center is huge which made walking the floor so nice all weekend. The panel rooms were spread out and there were plenty of quiet spaces to chill and take a break. Friday we did a quick initial lap of the floor to scope it out and then got ready for our Cosplay Social Media 10. Brandy, Chelsey, and I (Elizabeth) all participated and we had a solid crowd with some great questions and participation. Right after the panel we had a shoot with Lauren Nicole Photography in our casual Riverdale group. Lauren was amazing and we had so much fun shooting with her! She had us laughing the whole time and was willing to let us try a bunch of random shots. To round out a great start to our weekend, we went to a shadow cast showing of The Rocky Horror Picture show complete with audience participation and props. Saturday was a full shoot day for our Marvel trio. Michael Summers of Eitheros Photography was up first. Michael was gave great direction and had a lot of knowledge about the MCU which helped in staging shots. Noah Smith Images was next and he was super high energy and got some really dynamic shots. Our final shoot of the day was the official Marvel meetup which is always a highlight of cons. 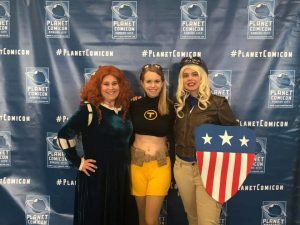 Brandy met several fellow Captain Marvels and also managed to find her Valkyrie. We finished the day wandering the floor and adding our already vast art collection. We did miss Brian Kessinger because he had to leave to catch a flight which was disappointing because Brandy and I have been obsessed with his art, but we’ll track him down eventually. On Sunday we got to meet the artist of the DC Bombshells and pick up some signed prints, a highlight of the weekend. Brany presented her Star Wars panel to a crowded room despite it being the very last event of the con. We wrapped up the day at the National World War I museum with a quick photoshoot and then chilled for the night with tacos and Futurama. Overall, this weekend was so much fun! I was so glad to have Brandy and Chelsey visit my new home and run around a con together again. We met so many great cosplayers including a Stan Lee who was an absolute delight. We didn’t get near as much sleep per usual and definitely did not eat too healthy, but being together again doing something we all love makes up for all of the exhaustion and post con crud. I can’t wait for next year’s Planet and will be way more prepared now that I know what to expect.